Understanding Your Bill | CARMA Billing Services Inc. Need more help understanding your bill? Please check out our interactive bill below. This is the date that the bill was generated. Bills are due 16 days after the bill date. This is the address in which the meter is installed and the service is supplied. This is the total amount due including past and present amounts. This is the date in which the invoice needs to be paid. Failure to pay by this date may result in late penalty charges. This is your account number which helps us identify you as the account holder. The number should be referenced when contacting us or making payments. This is the address in which the customer has requested the bills to be sent. It may or may not be the same as the service address. This number represents the percent of electricity lost as it travels through the Local Distribution Companies (LDC) distribution system to your meter. The factor is approved by the Ontario Energy Board for the LDC supplying your service territory. It is subject to change on an annual basis. This represents your total consumption (kWh) after the adjusted or loss factor is applied. Your consumption is adjusted to account for costs associated with electricity lost when travelling to your metered location. This shows the number of kWh consumed for the billing period. It is the difference between the present and past meter reads. This shows the start read and end read for the billing period. The difference between the two reads is your consumption for the month. The code indicates if the read is actual MR- meter read or estimated CE- computer estimated. This shows the number of billing days you are being billed for on this invoice. It is the number of days between the start and finish meter reads. This shows the start date and finish date for the period in which usage is measured. It is often referred to as the billing period. This is a unique number used to identify the meter at your service address. This shows the amount of your most recent payment. This amount is the amount owed on your previous invoice. For residential customers this shows the amount of debt retirement that would have been charged to you prior to the implementation of the exemption. This amount shows all charges due including any past balances that payment has not yet been received. This shows the total of all charges related to the current billing period. This shows the amount of gas consumed and billed for the last billing period. This charge only shows on invoices of customers who are billed for gas. This is the cost of water consumption and sewer services supplied to you during the billing period. Your bill may be separated into cold water and hot water depending on your location. This charge only shows on invoices of customers who are billed for water. This is a charge payable on electricity consumed in Ontario. The DRC amounts collected are used by the Ontario Electricity Financial Corporation (OEFC) to help service and pay down the former debt of Ontario Hydro. Effective January 1, 2016 residential customers are no longer required to pay the debt retirement charge. These are regulated charges reflective of costs associated with the administration of the wholesale electricity system and monitoring of the provincial grid. The delivery charge reflects the cost of delivering electricity from the generating stations to your home. This includes the cost to build and maintain the transmission and distribution lines, towers and poles and the operation of the provincial and local electricity systems. This also includes any charges for losses associated with the adjustment factor. A portion of the delivery charges are fixed and do not change from month to month. The rest are variable and increase or decrease depending on the amount of electricity used. Included in the delivery charge is the monthly service charge. This shows your past consumption history to make a quick comparison of year over year usage. This shows the amount of unadjusted electricity used and billed for in the last billing period. The Electricity charge is based on a two tier billing system which applies rates based on the amount of energy used and the time of year. In the summer the first tier pricing is applied to the first 600 kWh hours used. A second tier rate is applied to any usage over 600 kWh. In the winter the first tier pricing is applied to the first 1000 kWh hours used. A second tier rate is applied to any usage over 1000 kWh. The rates change from summer to winter rates on November 1 of each year and from winter to summer rates on May 1 of each year. The tiered rates are set by the Ontario Energy Board. Important messages and regulatory updates are shown in this section. 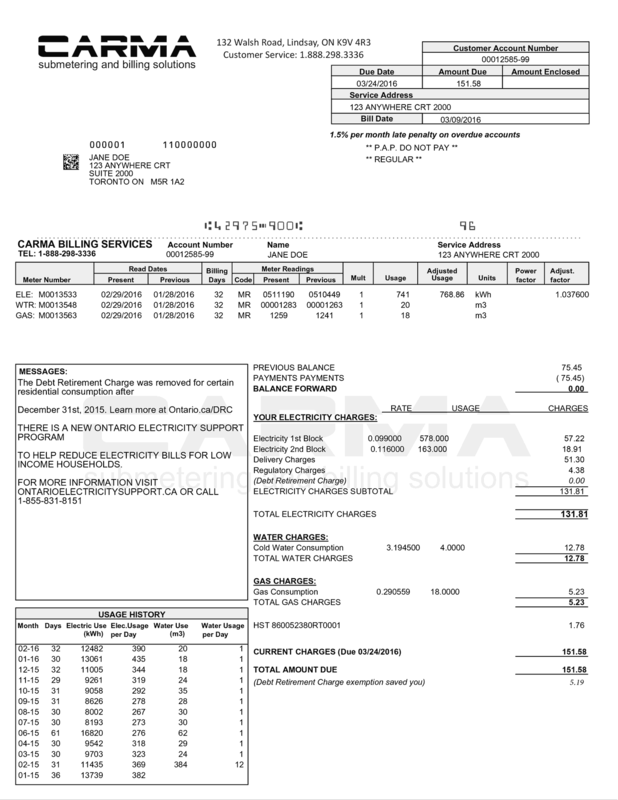 Click below to view our annotated bill.